Are You Having Problems With Your Safety Switch Tripping? 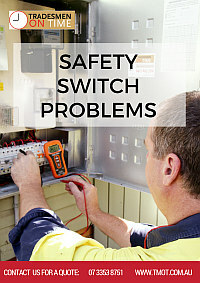 Is your safety switch tripping but you have no idea why or what’s causing it? Our free safety switch guide and troubleshooter will help you identify exactly what it causing the problem and whether you need to call an electrician or if it is something you can sort yourself. This guide is easy to follow and written in simple step-by-step format.